Whiskyfair Takao is a new show and, for Taiwan, a new kind of show – a departure from the Whisky Live-style events of the past, and a deliberate attempt to transplant the spirit of Limburg to the Far East. Angus MacRaild was there. Having recently enjoyed Blade Runner 2049 in IMAX, its imagery is much on my mind when stepping out of the airport in Taipei. A great curtain of pallid grey is drawn across the sky in the ebbing light of the evening. The architecture in this part of the city is concrete and jutting. The muggy air only adds to the dystopian sense. I buy a ticket for the bus and wait in a queue where face masks are a ubiquitous reminder of the pollution that squats and lingers in the skies and streets of Taiwan’s cities. People are friendly. The bus attendants speak English and smile; the woman in the queue next to me strikes up a conversation with authentic interest. I feel a long way from home in good way. Clammy, tired and sensing jet lag on the prowl in the periphery of my mind, I board the bus. I am here for Whiskyfair Takao in Kaohsiung. The first festival of its kind in the country, it is set to be a deliberate departure from the Whisky Live-style show which has dominated much of the Asian whisky scene for the past decade. Intrigue is high, and from the website and pre-show chatter, it seems that this festival is set to compound what is already an increasingly complex and mature market for Scotch whisky, particularly when it comes to the enthusiasm for single malt. I have a particular, personal intrigue when it comes to the Taiwanese whisky scene. Over the past two years of seemingly unstoppable growth in the prices of old and rare whiskies at auction, Taiwan is the one country mentioned time and again in conversations about what is driving these prices. Whisky is not all boom in Taiwan, however. The blended malt category seems to be in terminal decline, with consumers shifting to blends as they perceive little difference between the two categories. Overall growth has also been somewhat sluggish of late, due in part to market saturation and wider Taiwanese economic issues. However, this is a country with a serious and lasting fascination and thirst for single malts, and much of the consumer migration is upwards to more premium brands of blended whisky or to single malts. Taiwan also possesses two single malt distilleries – Kavalan and Nantou – with the former already garnering lofty praise and commercial success around the world, while the latter, judging from what I tasted over the weekend, may well soon follow suit. The festival takes place on the 74th floor of Kaohsiung’s Sky Hotel, a mighty, glass-flecked, inverted tuning fork that stands tall in the bay area of the city. The lifts accelerate you to the 74th floor within moments of setting foot in the foyer. The experience of being suddenly confronted with such gargantuan city and harbour vistas is, at first, an ear-popping discombobulation. Perusing the stands while the exhibitors set themselves up for the 10am opening time, I notice the names are different, but it all feels very familiar. The spirit of Limburg has been carefully transplanted. There is the bustle and muddle of independent companies, collectors, bars and bottlers setting out their stands with precision and care. It’s a different feel to the sleeker, practised operations of more commercial, big brand-oriented festivals. The stands are spread in a U shape around the observation floor of the Sky Hotel, which lends the event a cosy and, at times, ‘penned-in’ nature. There are, as you might expect, more Japanese and Asian-influenced whiskies and bottlings on the stands, but effort has clearly been taken to offer serious diversity and opportunity to visitors in terms of liquid. One of the most popular stands is that of Taiwanese collector KC Fan. His table bristles with old and rare bottlings the likes of which are rarely seen, even at Limburg, these days – Port Ellen Maltings; Bowmore 1963 30-year-old; Glenfarclas 21-year-old bottled for Giacconne, to name but a few. There are a few rough edges, typical of a show in its first year. The tastings are somewhat hurriedly assembled, but also well-attended and popular. There is a slightly hectic sense to the show as well initially, although this soon morphs into a good-natured hubbub once visitors fill the space. 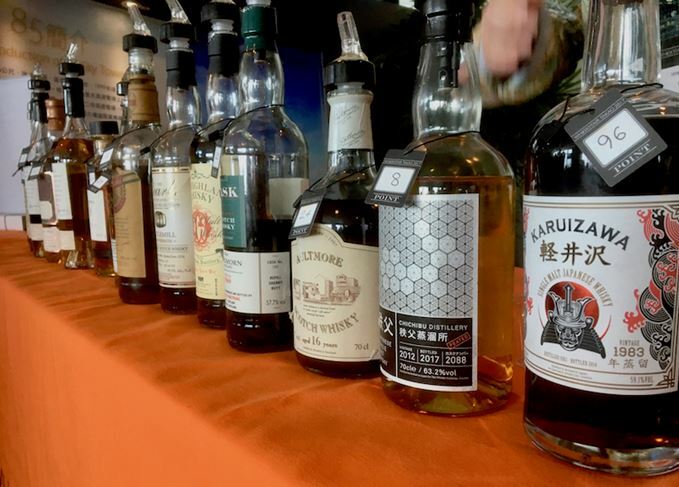 The show is attended by about 800 people over the course of the weekend, a figure which represents a tight clique of Taiwan’s serious whisky enthusiasts. And enthusiasm is very much the word. They descend on the varied mix of newer independent releases and old and rare bottlings with the same practised fervour and ready sample bottles as I’ve seen at European festivals. Knowledge is generally high, as is spending, and there is a genuine sense that this might easily have been an independent European festival. The whole event speaks volumes for the maturity and direction of the Taiwanese whisky scene. People here seem to possess the same sense of fascination and geekiness that mainland European enthusiasts have honed to a second nature. It’s little wonder that there are some serious spenders here causing ripples in the UK secondary market; most of these people became passionate about whisky when it was already very expensive and have little concept or memory of a time when it was anything else. There was virtually no talk of ‘crazy prices’ – something which has become a mainstay of European festivals. After hours we find ourselves in one of the city’s whisky bars, Drunken Master, where exhibitors and attendees from around the world mingle and dram together. It’s a fitting conclusion to a festival that feels as though it has arrived fully-formed. After two years of careful planning, preparation and more than a few frustrations, it justifiably feels a little triumphant for the organisers. It will be fascinating to see how much further they can expand the format next year. What’s for certain is that Taiwan remains one of the world’s most serious and fascinating whisky markets.